This third generation of the TRES line stands out immediately with its creative clarity and the graphic precise lines. The three slim hands allow the time to be read very accurately on the finely drawn 60th scale. 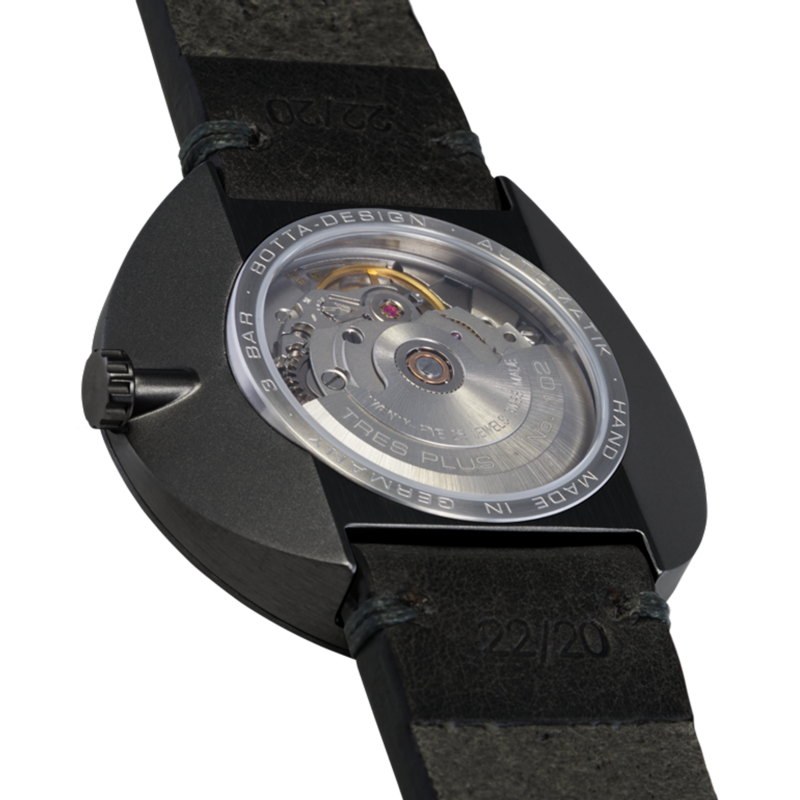 Only at second glance does the discreet numbering between the hour markings and the edge of the case reveal itself. An analogue time display fits best into a circular watchcase. Accordingly, all TRES models have a perfectly cylindrical stainless steel or titanium case. It is the design and the mounting of concealed strap lugs inside the base of the case that make it possible to develop a watch with such formal clarity. However, good design is not limited to aesthetics alone. Apart from the captivating logic of the case construction and the dial, the back of the watch has also been carefully crafted as the two strap lugs are concealed beneath the dial to optimise space. In between these we can find the sapphire crystal on the back with its finely engraved stainless steel bezel. 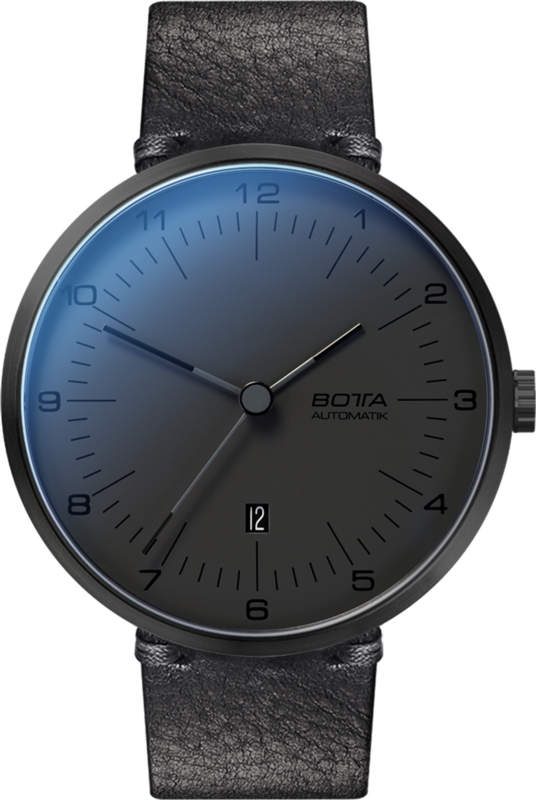 It provides a clear view of the mechanical drive of the watch, the extremely reliable ETA automatic movement 2824-2. Despite its 44 mm diameter, the TRES automatic can also be worn on almost all wrist sizes thanks to the integrated strap lugs. The two bevelled flanks on the underside of the case also allow considerably more freedom of movement for the wrist and forearm, thus allowing the air to circulate better at the same time. The design of the reverse side makes the 8.8 mm-high designer watch look even flatter. No matter from which perspective you look at the new TRES, it always looks architecturally clear and aesthetic. The double-domed sapphire crystal with its pronounced narrow stainless steel top ring complements the elegant lines of the entire watch. 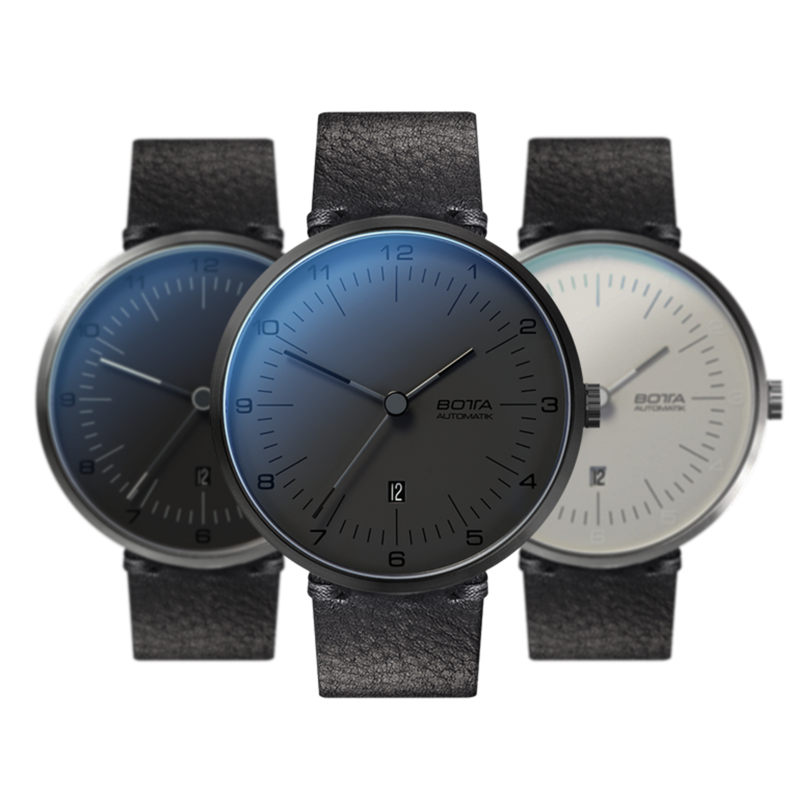 The anti-reflective coating on both sides of the watch glass provides a significantly improved transparency and colours the considerably reduced reflections on the watch glass with a subtle bluish shimmer. The new TRES Automatic is for people with the highest standards for design and quality. A sophisticated display principle also deserves a high-quality movement. We have opted to use the ETA 2824.2 Swiss-made automatic movement, which is one of the most reliable mechanical movements available. This gives you the very best chance of still deriving great pleasure from your purchase even after many years. In addition, every single movement spends several days being carefully adjusted for maximum precision by a watchmaker – this is our way of contributing to your punctuality. The TRES Automatic All Black will be shipped . Until then, the model can be pre-ordered at a discount of € -940. Shipment will be on a first come, first served basis.